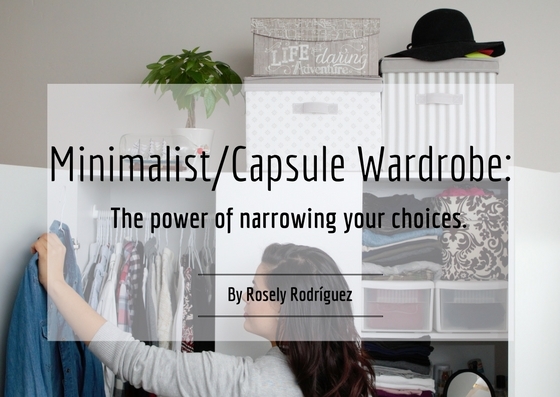 It has been already 2.5 months since I created the Skillshare course “Minimalist/Capsule Wardrobe: the power of narrowing your choices”. A class I created just for fun, unexpectedly has 156 students, 6 thumbs up and two beautiful comments. Daria, Geraldine, Justice, Reece, susannah & Daniella for the thums up! And to all the students who took their precious time to take the class. You can save a lot of time and money for your weekends guaranteed. I couldn’t find a way to send a message to the ones who rated my class, so as a “thank you” I’ve created this blog posts with the steps I took to create my Spring/Summer capsule. I thought it would be fun to do this as the first project of the class. Share a before and after of your wardrobe and drawers. Talk about your experience while creating your own capsule, including (but not limited to) how you chose your color palette, how you discovered your body shape and complexion, and how will you enhance the pros and hide the cons of your ideal look. It’s good to clarify that we are all unique individuals. Different bodies, different taste, different skin tones and so on. That’s the most beautiful thing. Be aware that I can only talk from my perspective and what is suitable for my type of body and taste. Hopefully the steps I took are applicable for you to find your unique style. If they are not suitable for you, please share your journey so other students and readers can beneficiate from your unique story. But seriously though, I dress with clothes I feel comfortable with. It doesn’t matter if is a fashion trend for a particular season, if I’m not comfortable or doesn’t enhance my body I wont wear it. Since I already have a decluttered wardrobe, I took a different approach than the one explained in the course. I basically brought out of the storage the items suitable for the next season and saved the ones from my closet that I won’t use for now. Keeping in mind that the weather turns bipolar when is transitioning from one season to the other, I kept at least a pair of boots and a coat. After this I took all the keepers and separated them by color. This helped me have an idea of what my color pallet would be. You ought to make the best with what you have. The point of having a small closet and changing it every three to six months is not to buy brand new clothes every time. Part of the benefits I teach in the course is that a capsule wardrobe should help us lessen environmental issues. The more you buy, the more natural resources are used to fulfill the demand and more garbage is produced. Garbage that can take more than 200 years to decompose. After the previous exercise, I identified 5 items that were not easy to combine in between them. Mainly because of the prints on them. I found some apps to identify the color palette on them and save them on my phone. Just in case I needed to buy something, I could have these hard to combine items in mind. Resuming this information, basically my pallet for the season is as you can see here. I don’t complicate myself with the colors of the season you will see on the internet. I make my palette with the colors I have. For this step I follow a simple rule: Light/bright for warm seasons and dark colors for cold seasons. Look at the picture of my plain belly in the middle, and compare it with both pictures on left and right. Don’t you notice the difference? I’m in between the rectangle and the hourglass shapes. Since I like the hourglass shape better, I use items that visually help a little. Such as these high rise pants and the blouse to the waist. But that’s me, my taste. Maybe you are a model and you want to keep your rectangle shape. I read somewhere designers like rectangle shapes so the curves won’t alter the design. Or maybe you are a full hourglass and you don’t like it. In both cases do the opposite. Same old me, same high rise type of pants, just different colors. Color are helpers to achieve your ideal shape and complexion. If you want to look bigger on the bottom or the top, wear light colors, if you want to look thinner do the opposite. And don’t forget your skin tone when deciding on colors please. It’s kind of sad, I love yellow and orange, but it is what it is! Just eliminate and don’t buy again anything that doesn’t enhance your figure to your best self. I also talked on the class about Classic & Versatile items. But sometimes versatile items are not versatile on themselves, they become versatile with our imagination. On the first two images the jumpsuit is featuring two more of the versatile items. You want your clothes to be interchangeable. Basically, you can wear anything under or over it, and for any occasion. Even if you are going to the office or for an interview (picture on buttom right). I like these because they can make any item look different. It helps me wear items with big cleavage for any occasion. Did you notice is goes with the other 3 example items? Who said having a small closet means being boring? It actually boost your creativity. With this single piece (and some pins), I created 7 different cool tops and 1 skirt. Almost all tricks I did with the kimono can be done with these shirts. And we are not even mixing with different buttoms. And this, my friends, is what makes us memorable (as explained in the course). I bought a magazine the other day as a research for this post and all colors are there as color of the season. I was very surprised to see fall colors all over the magazine, which proves my point: as long as it suits your taste and enhance your figure, that is the color or trend of the season for you. Don’t mind advertisement. Wear what is going to make you be different, no part of the crowd. On the course I advise to narrow the options all the away, including where to shop. When I need something I go to one or two stores, no more. The best option there will be the one I’ll buy. Sometimes I go with an item that I want in my mind, but if is not at the store I just buy something with a similar fuction. You will notice the same pattern. Shape & complexion in ming: High rise pants, skirts to waist, hourglass shape helpers ingeneral. Color Palette & interchangeble items. I like to have my hands free, so crossbody purses and backpacks are my must haves. The clutch for the party nights, of course. Shoes are self explanatory here. Oh the choices we make! The reason why I’ve reduced my choices that much is because of Barry Schwartz and his TedTalk and book “The Paradox of Choice: Why More is Less“. Click hereClick here to see his TedTalk if you haven’t. The more options you consider, the more buyer’s regret you’ll have. The more options you encounter, the less fulfilling your ultimate outcome will be. – Tim Ferris, The 4-hour workweek. I chose not to complicate myself. With a closet design for my specific needs and taste I’m sure I’ll still look good. How about you? Are you ready to simplify your life to save time and money for the weekend? I hope I’ve inspired you to create a project on the class, or take the class if you haven’t by clicking HERE. 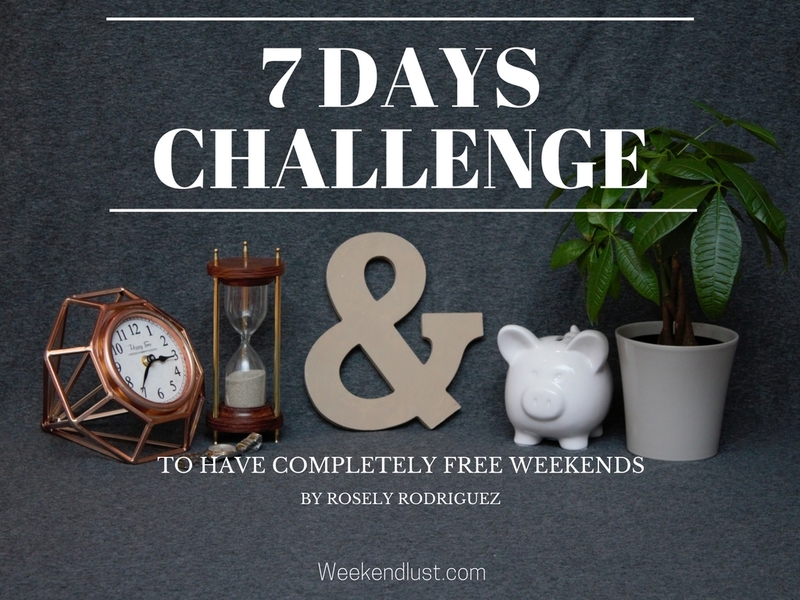 If you want more tips about saving time and money for your adventurous weekends click HERE and join the “7 Days Challenge to Have Completely Free Weekends” and join the Weekendlust community. Disclaimer: From time to time, blog posts may contain affiliate links, which means that, if you purchase any product linked to the website, a compensation/commission will be received. Over consumption is not promoted on this blog, so if you don’t really need advised products, DON’T BUY IT. Make the most of what you already have. Read more on Terms & Conditions page.